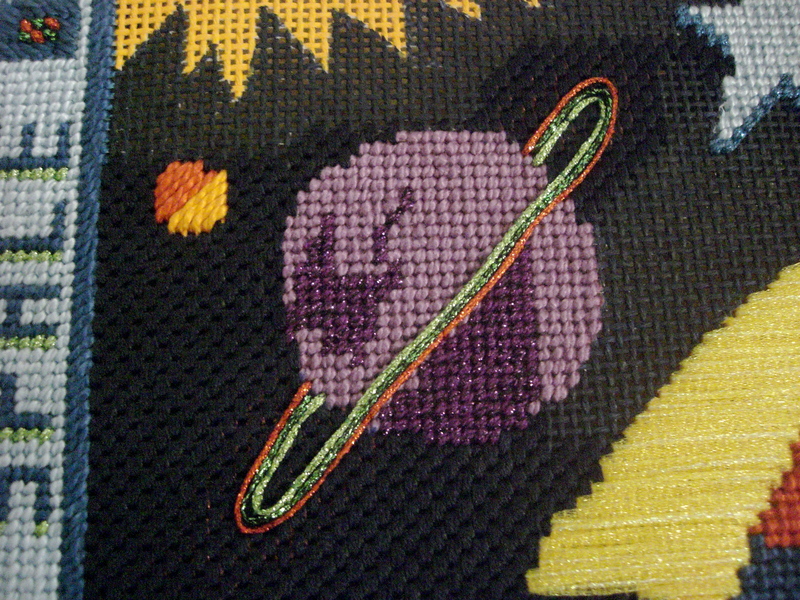 I’ve been working all day on the background…and though I cheated a little bit by working in odd shapes, I rewarded myself by adding the rings around Saturn. The rings are Kreinik #16 braid, couched down with a strand of matching-colored floss (which hopefully you can’t see). As you can partially see in this picture, earlier in the day I added the wings of the rocket ship. I created them using a simple satin stitch in Petite Frosty Rays. I started experimenting with beading the sun, but I’ll save that photo for another day. This entry was posted on Monday, March 8th, 2010 at 12:47 pm and is filed under Uncategorized. You can follow any responses to this entry through the RSS 2.0 feed. You can leave a response, or trackback from your own site.